For companies looking for entertaining methods for team building and employee appreciation, THEY improv provides a variety of fun approaches for murder mystery dinners in Lake Geneva for a variety of groups and gatherings. THEY have choices that range from using participants in the show to strictly using our case for client and employee appreciation, holiday gatherings and meetings and incentives awards programs. Hire THEY improv for a customized show just for you. 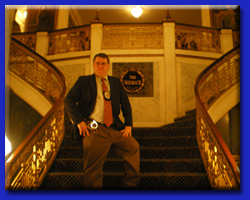 Yes, the perfect way to enhance any corporate event, banquet or private party is a customized Lake Geneva murder mystery dinner show or lunch written just for the group and venue involved. Perfect for teambuilding corporate events, meetings and incentives awards, weddings, family gatherings, dinners or charity fundraising! Actors from THEY improv come together and set up a Lake Geneva murder mystery dinner or lunch that the audience helps to solve. Interacting directly with the participants of the event, attendees help examine clues, evaluate witnesses and alibis, choose from a variety of suspects and determine the culprit. Once THEY begin, your audience will meet and talk with the crazy cast of characters, witness a crime and then work to solve the crime, all without CSI's crime lab! Laugh along with our professional, but bizarre, crime solver, as audience members help him interrogate suspects and work his way through the winding maze of clues. This often makes audience members shine, which is perfect for meetings and incentives awards gatherings, leaving employees with a sense of being appreciated. 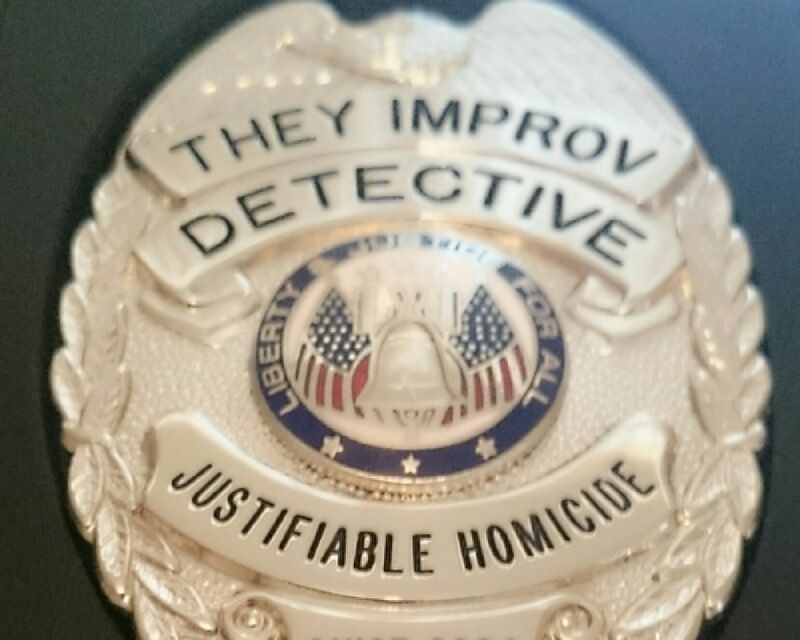 THEY improv is one of the only companies in the country that provides 'ambush' murder mystery dinners. These are corporate events and private parties where the audience is NOT aware that a show is taking place. Using a variety of techniques, THEY improv provides uncomfortable situations that get audience members to talk to each other and compare notes as they are confronted by awkward situations. For example, one of our cast members might be at your party with his girlfriend and his wife shows up. Note: We let the audience know it's a show at the right time. We don't want anyone to actually call the police! The Frick & Frack Show is a new development that we've made and involves two detectives, Detective Frick and Detective Frack, who investigate an improvised whodunit while directly involving your audience members in the crime. Audience members are introduced to the idea that they are to accept any facts that are given by the detectives as fact. Any questions audience members are asked, they make up any details that they like and those details will be incorporated in the show by our detectives. No two shows are alike and thus the final answers are truly a mystery. Likewise, the scripts can be adjusted to bring your audience members under suspicion. They can be interrogated and engaged in a roast type of environment. They can be found innocent by the audience with them getting applause. If you prefer, we can keep them as key suspects by using information known about their past to dig them deeper into the Lake Geneva murder mystery. For team building efforts, we have a variety of techniques used to benefit the bonding of the employees. For those that don't necessarily know each other so well, or for smaller groups looking to keep costs down, we have Clue Parties. This has everyone with a character and they all talking to each other and sharing information to determine the culprit in their midst. For slightly larger groups, say from 20-100, we have the Cambridge Solution where we have a few of your people as characters and they go from group to group that works together as a team to build a case against one of the suspects. This is also a great way to get the bosses to speak to everyone at the party and is thus a great way to celebrate the holidays or just to say thank you at the end of a project to say job well done. Similarly, a smaller version called the Dartmouth Plan can work with groups from 5-20 filling in the gap for smaller, more intimate groups. Our gala shows or straight whodunits that are for corporate events or banquets can also have the solutions done by group allowing for the advancement of teamwork. After all, coming up with a group solution is the same in one of our shows as it might be for solving a problem in the office. There's no better way to train people than to make them think they're doing something strictly for fun! And even if we don't know anything about the audience ahead of time, our ambush shows can completely immerse the audience in the midst of the mayhem until they realize that it's a show. This causes the audience to fully become involved in the event and the things that they have seen influence their solving of the crime because our actors can adjust to changing circumstances. These shows can be provided not only in the evening, but also make a great idea for a lunch or at other times during the day that might not even be around a meal. This goes well with ambush scenarios when our people are supposed to be there for another purpose. Let us discuss various ideas that can work for you. Because every corporate event and private party is custom designed you have to contact THEY improv directly to receive a quote for your banquet. 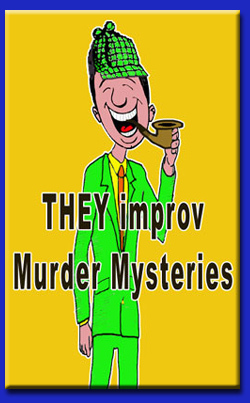 Contact us today to learn about how THEY improv can bring you the Lake Geneva murder mystery show that will have all your friends talking about for years! So if you are hitting the links at the Geneva National Golf Club or at the Grand Geneva Resort, look to THEY improv for your entertainment. We are proud to serve all of Walworth County including Bloomfield, Burlington, Como, Darien, Delavan, East Troy, Elkhorn, Fontana, Genoa City, La Grange, Lafayette, Linn, Lyons, Mukwonago, Richmond, Sharon, Spring Prairie, Sugar Creek, Troy, Whitewater, Williams Bay and the rest of Wisconsin including Janesville, Beloit, Racine, Kenosha and everywhere else in the state. Contact us at info@THEYimprov.com or by calling (866) 219-4386.